Adding the next chapter to a storied property begins -- but does not end -- with a respect for the past. This National Register-listed estate has an original home dating back 325 years with an addition by Stanford White, and numerous outbuildings reflecting each period since the 1680’s. 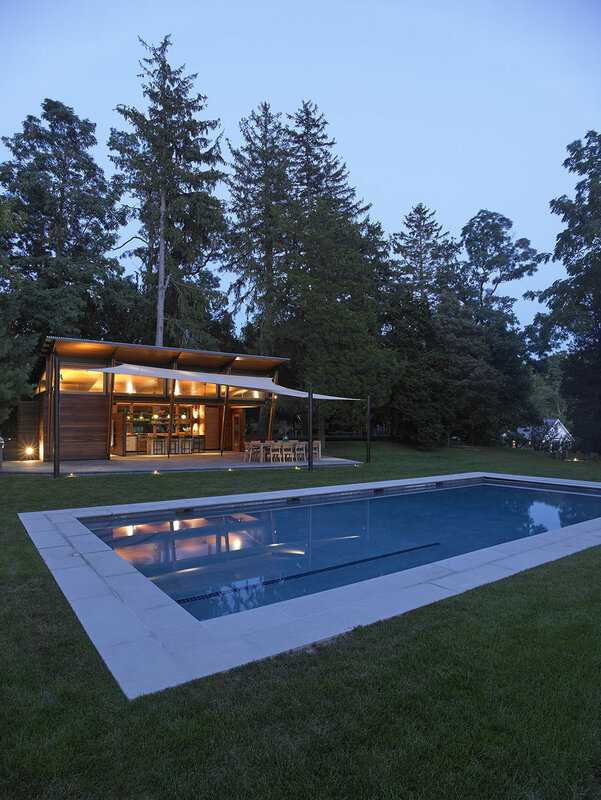 The new owners requested one more outbuilding -- a poolhouse to serve their growing family and to host guests. Despite a high-level of 21st century amenities -- and being built to withstand hurricane-force winds -- we strove to emphasize simplicity of form, lightness of structure, and continuity between sheltered and open space. Seasonally-removable shade sails define and protect the primary outdoor dining space, and filter the low-angled western sun from the kitchen. A sheltered courtyard steps into the slope while adjacent decks float just above the site, allowing moisture to reach the roots of specimen trees between which the built elements were inserted. As a representation of early 21st century building practices for future generations, this undertaking has demanded a high level of execution that showcases craft, material, and detail while celebrating sun, stone, steel, water and wood.